3.0.0 Released! Website down but Mirrors are OK! There is no printer on the earth, which can print 300cm x 300cm at once. But your family printer may print it with 140 sheets of paper. If you live in Beijing and has a big printer which can print 300cm x 300cm, or if you know an office in Beijing who has a big printer which can print 300cm x 300cm, please tell me. 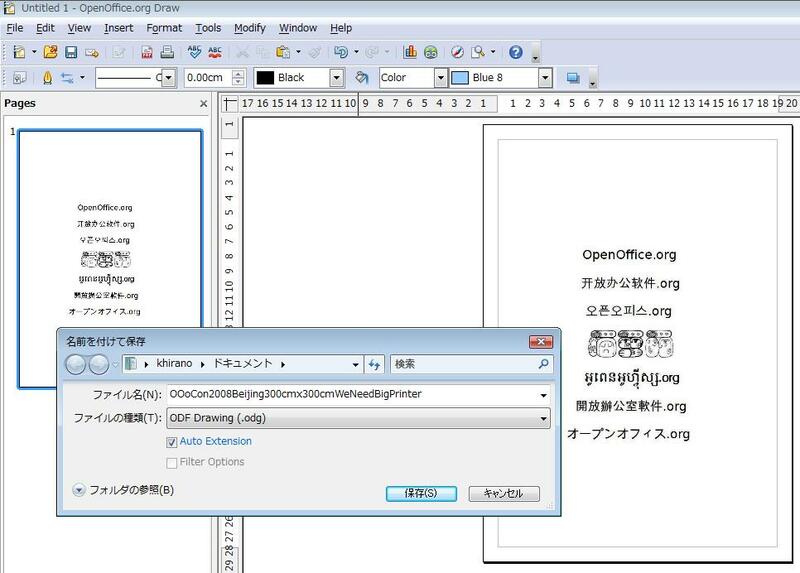 I am coming to you with my note PC which has a ODF file, OOoCon2008Beijing300cmx300cmWeNeedBigPrinter.odg, created by OpenOffice.org 3.0 Draw. I have just added Khmer one. I added Traditional Chinese one. You may see this at NLC (Native Language Confederation) booth in OOoCon Beijing. On October 21st Florian Effenberger, OpenOffice.org Marketing Project Colead, forwarded a request from Ms Zaheda. She decided to start a map of the OpenOffice.org story and community, using personal accounts from contributors and users. She's calling this project the OOo Community Mapping Project. To make this a success, your participation is absolutely crucial, she says. Don't be shy! Enter yours! Let us check one of our mirror servers. You will find 28 directories and you can check what localized builds are QAed and released as final. It is a Japanese phrase which means "We're wasting" or "We're leaving something unused." It is naturally followed by an idea that we should not leave them unused, we should use them, reuse them, recycle them, utilize them or leverage them. 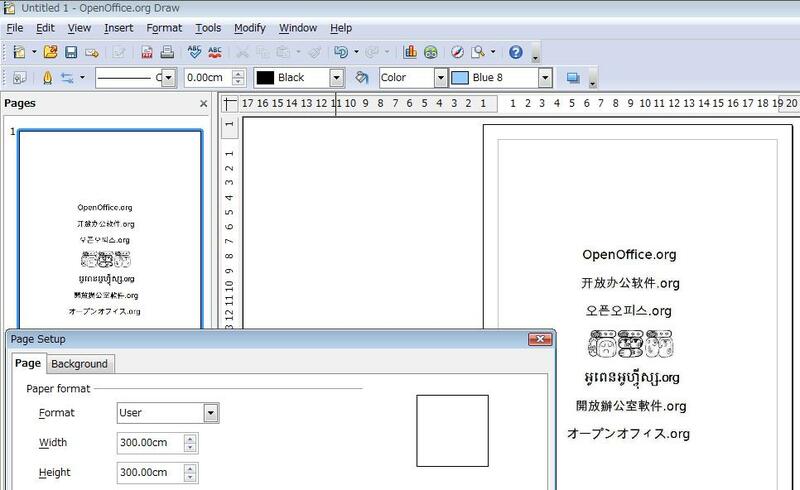 OpenOffice.org 3.0.0 has language packs for 72 languages. 1 Afrikaans, 2 Arabic, 3 Assamese, 4 Belarusian, 5 Bosnian, 6 Breton, 7 Bulgarian, 8 Catalan, 9 Chinese (simplified), 10 Chinese (traditional), 11 Croatian, 12 Czech, 13 Danish, 14 Dutch, 15 Dzongkha, 16 English (GB), 17 English (South Africa), 18 English (US), 19 Estonian, 20 Finnish, 21 French, 22 Galician, 23 German, 24 Greek, 25 Gujarati, 26 Hebrew, 27 Hindi, 28 Hungarian, 29 Irish, 30 Italian, 31 Japanese, 32 Kartuli, 33 Khmer, 34 Kinyarwanda, 35 Korean, 36 Kurdish, 37 Lithuanian, 38 Macedonian, 39 Malayalam, 40 Marathi, 41 Nepali, 42 Northern Sotho, 43 Norwegian Bokmål, 44 Norwegian Nynorsk, 45 Oriya, 46 Polish, 47 Portuguese, 48 Portuguese (Brazil), 49 Punjabi, 50 Russian, 51 Serbian, 52 Serbo-Croatian, 53 Slovak, 54 Slovenian, 55 Sotho, 56 Southern Ndebele, 57 Spanish, 58 Swahili, 59 Swedish, 60 Tajik, 61 Tamil, 62 Telugu, 63 Thai, 64 Tigrinya, 65 Tsonga, 66 Turkish, 67 Ukrainian, 68 Urdu, 69 Venda, 70 Vietnamese, 71 Xhosa, 72 Zulu. Let us make them final releases. You can do it. 1. Download English (US) version and install it on your machine. 2. Download Your language pack and install it on your machine. Then you can post many questions to dev@qa.openoffice.org in ENGLISH. There you will find names of NLC Lead and Co-Lead, and CC members, which are linked to their mail addresses. 3.0.0 is so popular that no one can access the openoffice.org website right now. But its bouncer and mirrors are working well. And it is a very good idea to check the QATrack. PS: QATrack is one of the Sun Open Source Community Innovation Award winners. "Key Benefits" tells us this good news! Scroll down the page and check "Product Comparison" up. You will see over 90 languages "listed" there but you should check "Status" and "Comments" before you say exact number of languages really "supported." Go there and you can purchase it right away!